Nicolette Franck has been named an assistant coach of the Wayne State women's hockey team. Franck, a former goaltender at Yale University, brings a vast level of coaching experience to the Warriors. "Nicolette is the final piece to our coaching staff and I am excited to have her aboard," said WSU head coach Jim Fetter. "Her coaching experience and knowledge of the game will be a huge asset that our players will certainly benefit from." 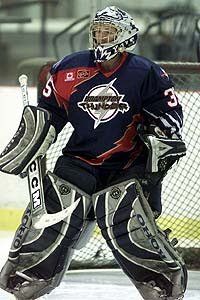 After graduating from Yale with a bachelor's degree in psychology, Franck spent two years in the National Women's Hockey League, playing for the Brampton Thunder (pictured) and Toronto Aeros. She also played goalie for the 2006 Women's National Inline Hockey Team, winning a silver medal at the FIRS Inline World Championship and gold at the North American Roller Hockey Championships (NARCh) Tournament, where she was named Top Goaltender. Franck has coached at various levels over the past decade, including three years with the Etobicoke Dolphins in Ontario. Beginning as a goaltenders coach for the Midget A squad in 2004, Franck moved all the way up to the head coach position of the Intermediate AA team in 2007. Please click here for the full Wayne State Hockey press release.